Kitchen! Kitchen! : lemon basil pan roasted chicken....at kitchen! kitchen! 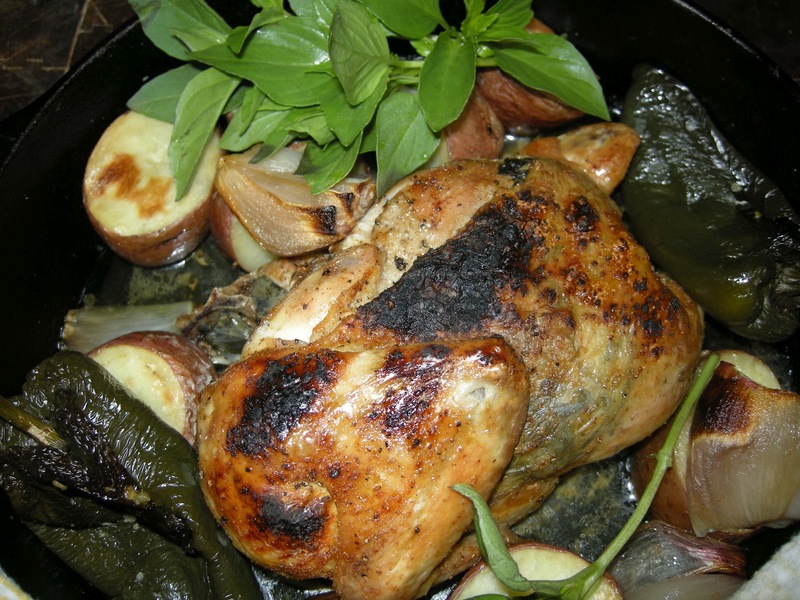 lemon basil pan roasted chicken....at kitchen! kitchen! bunches of lemon basil and garlic under the skin. The result was a time travel back to my childhood. potatoes, poblano peppers, and shallots with the chicken. The drippings becomes the sauce for this delicious dish. Lossen the skin gently and insert some lemon basils under the skin and 2 cloves of garlic that is cut in half (make sure you season the inside also before stuffing it with basil). On a separate bowl season with salt and drizzle some olive oil on the potatoes, poblano peppers, and shallot; then scatter them around the chicken on a large cast iron pan. Bake on a preheated oven 350F for 50 minutes until done. Broil for 3 minutes on high to get that blackened roasted color. Garnish with bunches of fresh lemon basil and serve with jasmin rice.